Each of the Russian choppers bidding for Indians contract is unique. Will India pick up the best bet? A total of three Russian helicopters at once are taking part in India’s tenders to supply assault combat helicopters: the firepower support machines Mi-28N (the Night Hunter) from Mil and Ka-52 (the Alligator) from Kamov, as well as the lightweight multi-purpose Ka-226T, also from Kamov. Whereas the first two are competing to be included on New Delhi’s shortlist for procurement of 22 assault helicopters, the 226’s bid is part of India’s Defence Ministry’s tender for 197 reconnaissance and observation helicopters. The Black Shark’s history began back in the 1970s. As early as December 1976, the USSR Council of Ministers instructed engineers to develop a brand new combat helicopter to replace the Mi-24, which by the mid-1970s had garnered a number of rather negative reviews following combat missions in various hot spots. To minimise the risk of failure, the project was assigned to two design bureau, Mikhail Mil’s and Nikolai Kamov’s. By 1986, the first Mi-28 and Ka-50, designed by the late Mark Vainberg and Sergei Mikheev, disciples of and successors to the two prominent engineers, had been developed. Many test flights and numerous commissioning boards later, the Ka-50 Black Shark was selected and commissioned by the Army in 1995 (by Decree of the President of the Russian Federation No. 883 of 25 August 1995.) The Shark project cost the federal budget more than a billion dollars. Yet the Ministry of Defence did not get a chance to take delivery of these helicopters: Throughout the 1990s, the federal budget had next to nothing to pay for defence equipment. This was not, however, the only obstacle to adoption of the unique machine by combat troops. Some Air Force representatives flatly rejected the very idea of the Ka-50, designed to be flown by a single person, combining the functions of pilot, navigator, and operator of all of its combat systems, including guided anti-tank missiles, non-guided missiles, and an automatic rapid-fire cannon. Despite what the Kamov pilots demonstrated, it was insisted that no military pilot could be expected to be a Jack-of-all-trades, while keeping an eye on the enemy and watching the horizon to avoid crashing into a tree or a mountain when flying at low altitude. They remained unmoved by the counterarguments that, if fighter jet pilots managed to do it all even at supersonic speeds, helicopter pilots would be able to do it too, because their speeds are much lower, especially since the Ka-50 was equipped with an automatic horizon tracking and obstacle avoidance system. In any case, there was no money to launch serial production of the Black Shark (a nickname the helicopter received after starring in a feature movie.) The crisis of the late 1990s – early 2000s made the machine unaffordable. Nevertheless, the Ka-50 became a star of international air shows, where Kamov test pilots performed aerobatic wonders and some military officials showed off the new machine as proof of their frenetic activity to strengthen the country’s defences. 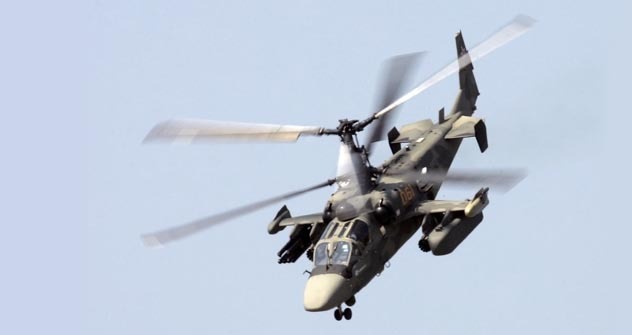 In 1998, Kamov took part in an international tender to supply helicopters to Turkey’s Air Force (but its NATO allies, the Americans, pressured the Turks into choosing the Apache over the Black Shark.) Then, fed up with the talk about a single pilot not being able to fly the combat chopper, the Kamov engineers rolled up their sleeves and started work on a two-seater version of the Ka-50 – the Ka-52 (Alligator.) Working from the Black Shark’s strengths, they created its “son”. And Defence Ministry brass revived their chorus about “unique machines that are ahead of their time,” but still without putting any money where their mouths were. Simultaneously, Mil design bureau engineers started refining their Mi-28N by making it an all weather and 24/7 machine, like the Ka-50 and the Ka-52. The Mi-28N became a competitor of the Black Shark and the Alligator. In December 2003, the then Commander of the Russian Air Force, General Vladimir Mikhailov, decided that “the Mi-28N would become the mainstay combat helicopter of the nation’s Air Force”. He explained that “whereas all helicopter units would receive the Mi-28N, the Kamov machines would be only sent to units that carry out special missions”. “Over recent years, engineers have upgraded our new Mi-28N machine to world-class level. What’s more, the Mi-28N has no peers. This chopper can engage the enemy at an altitude of five metres or more, while remaining invulnerable (the hull can endure a direct hit from an American M61 Vulcan 20 mm cannon and the windshield withstands 12.7 mm bullets.) The helicopter is fitted with standardised Russian-made equipment and is relatively inexpensive to manufacture. The Defence Ministry plans to procure around a hundred of these machines for the Army in 2011. Yet the Ka-52 Alligators, which boast a number of very big advantages over other choppers, will also join the ranks. At the May Victory Parade in Moscow, the Mi-28N Night Hunter and the Ka-52 Alligator, as well as the Ka-50 Black Shark, flew over central Moscow, over Red Square together, in a single combat formation. This suggests that the Russian Army’s front-line Air Force units will need all kinds of helicopter. And it is up to the Indian Army to decide what it needs. At least, as helicopter pilots say, there are machines that are ahead of their time and that pose a challenge to pilots not unlike the way beautiful women pose a challenge to men – will they be up to it or not. Not every soldier can rise to such a challenge.